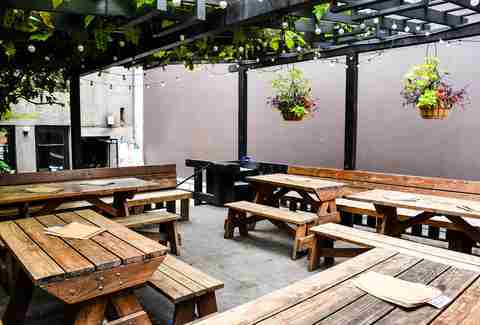 For a city that spends most of its time under gray skies, it’s remarkable how many patios Portland has. Because of that, we’ve chosen only the best and had to excluded many. We avoided patios completely without cover -- we don’t want you to bake in the sun -- and ones that are too exposed to a busy street. Likewise, we’ve stuck primarily to bars, with a few exceptions. 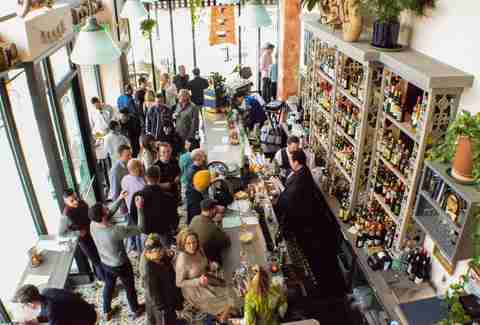 When it was all said and done, we managed to narrow the list down to a manageable 14 great spots for outdoor drinking. “It could always be wurst” reads the sign on the patio at OP Wurst, and it could definitely be worse than sitting out on the patio at Olympia Provisions new hot dog shop and wine bar. It’s a bit exposed, just off of Division Street, but the short walls filled with red geraniums and the tables with umbrellas make it a pleasant spot to enjoy a frankfurter and a cocktail while watching the cyclists go past on 28th. 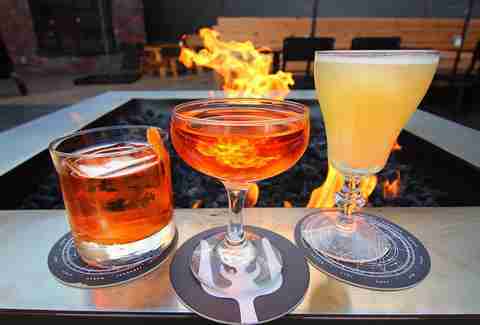 Revival, the outside bar at Portland’s favorite speakeasy/museum, The Bible Club, is only open during the summer. In those months you can find a smaller menu of rotating, simplified cocktails at lower prices than inside, as well food, beer, and wine. Live bands play weekly, and the whole thing feels like a casual neighborhood party. Portland’s newest brewery/cocktail bar is Wayfinder Beer, and with almost 9,000 square feet it can fit a massive crowd. The sprawling wood deck itself can fit a hundred guests. With umbrellas for shade, a fire pit for warmth in the evenings, and Wayfinder’s own lagers finally on tap, it’s sure to bring in crowds all summer long. This Venezuelan spot has a hidden outdoor dining area on the top floor -- which we suppose is no longer hidden. Oh well. It’s almost entirely closed in, with a vaulted cover that’s open on the sides, but it’s still a patio -- with a fire pit as well as a bar. You have to order food at the downstairs counter, but you can grab shots of tequila or mezcal margaritas at the bar upstairs. It’s one of the biggest patios in town, with long tables, a fire pit, water bowls for dogs, large umbrellas, and more. You’ll generally be able to find a seat here, but getting into the building can be an arduous process on the weekends, especially when bands are playing live shows. 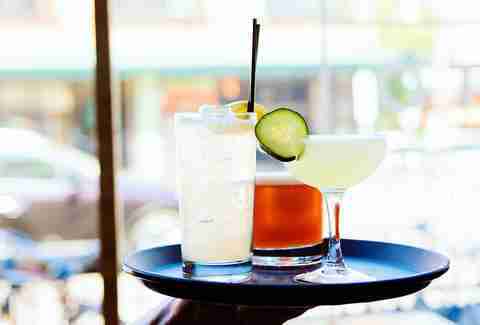 Sneaking in during happy hour is the best strategy. 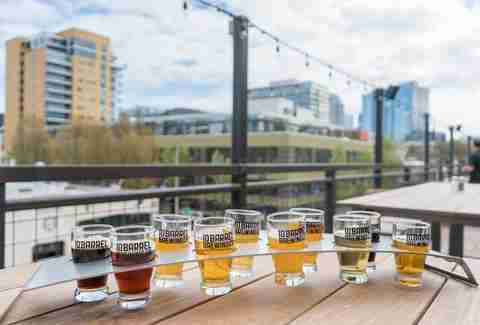 Grab a pint of Pacific Northwest beer and check out the amazing view from the covered rooftop patio at Altabira. The beer-focused restaurant offers the best view of the city east of the river (and one of the best overall), as well as great American food, beers, and cocktails. waterfront overlooking the Willamette River. A small but lovely patio that mimics the interior’s Swedish design, Aalto Lounge’s back area is usually packed. This is especially true during summer happy hours -- from 5-7pm every day you can get $3 cocktails or a $10 bottle of wine, leading to crowds of recent transplants in their mid-20 spilling out of the bar after happy hour ends at 7pm. That just leaves the patio available for the more, well, discerning clientele. It’s not the prettiest or the coziest patio in Portland, but Momo’s back deck is really the only one Downtown. It’s usually packed with hipsters and PSU students who huddle under the heat lamps in the winter months, but spill out onto the greater patio to soak up the sun in the summer. There are also two covered areas for those looking for shade. 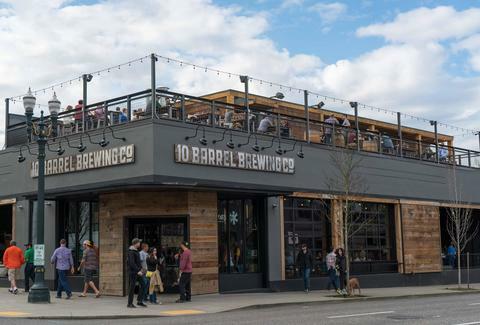 A lot of breweries have large patios, but only 10 Barrel, nestled in NW Portland, has a rooftop patio with a view of the neighborhood, Downtown Portland, and the West Hills. It also has 20 different beers on tap so, thankfully, you won’t have to go back down to get a second (or third) round. It’s a convivial spot to enjoy a cold beer on a sunny, Pacific Northwest day with friends. 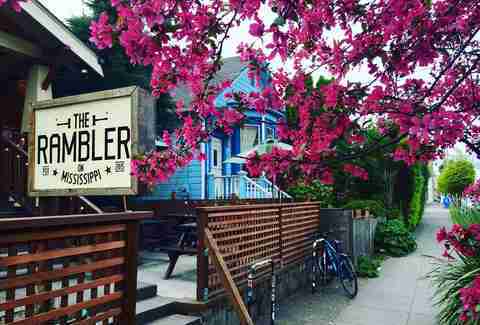 Mississippi Avenue is packed with great patios, and The Rambler is no exception. 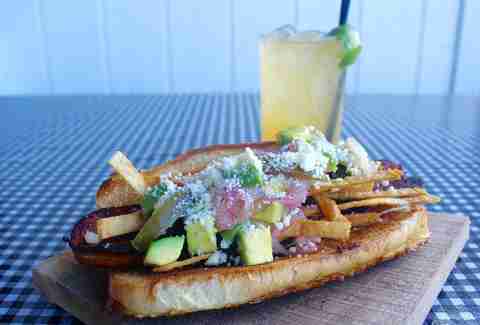 Here you can play bocce ball or just sit in the shade whilst enjoying a cold one and digging into a frito pie. If you’re into people watching, the smaller front patio provides a great view of Mississippi. This little SE cocktail lounge has an adorable backdoor patio, completely enclosed with a wooden fence strewn with lights. When it’s hot out, the thick canopy of blossoming wisteria keeps the patio space cool, and in the colder temperatures, heat lamps are lit for warmth. 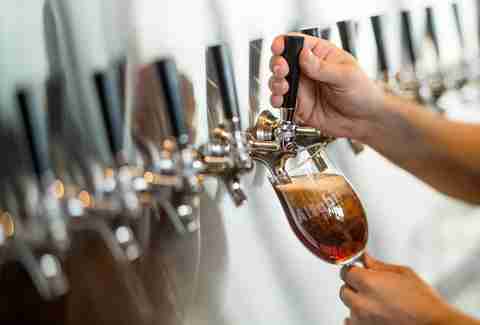 It’s best enjoyed during happy hour, when beer and wine prices are low. Interurban straddles the line between bar and restaurant, with a great cocktail program and full dinner menu. The back patio is fully enclosed and lined with plants, so it’s isolated from the rest of the busy neighborhood. Half of it’s covered for shade, while the other half is open for those who crave the sun. Both are dog friendly, and the perfect place to spend a warm afternoon with a cold drink. 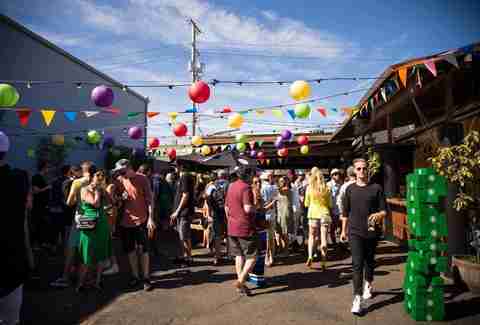 Alex Frane is a native Portlander, but he lives for the 12 or so days of patio season each summer. Track him then, and all the other days, at @FraniacDrinks.